I have a confession to make: I am in absolute love with Donald Duck. He is by far my favorite Disney character, and he made his screen debut on this date in 1934. At that time, and for the following fifty years, the voice of Donald that I laugh at and love to hear was expertly provided by Mr. Clarence C. Nash. According to Wikipedia, Mr. Nash was born 7 December 1904 in Watonga, Oklahoma. He married Margaret Seamans and had two children. 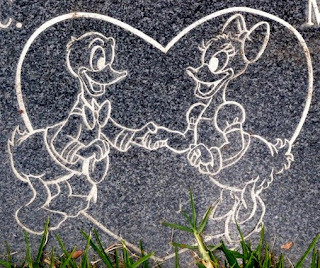 In addition to the voice of Donald, Mr. Nash also performed as Daisy Duck in her early appearances, as well as Donald's nephews Huey, Dewey, and Louie. Mr. Nash died 20 February 1985 and was laid to rest in San Fernando Mission Cemetery at Mission Hills, Los Angeles County, California. His wife joined him in 1993. 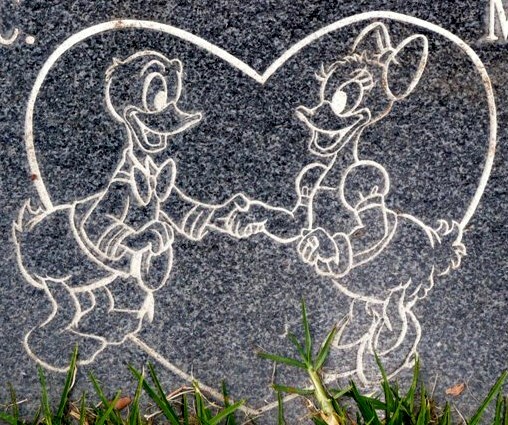 On their shared lawn style gravestone is an image of Donald and Daisy Duck. Thank-you, Mr. Nash for providing me and so many others with side-splitting enjoyment that is felt even to this day. It is a legacy of yours that will be shared for many years to come... and Happy Birthday, Donald!